FAST PHO joined our Mission to help provide access to “Clean Water for All by 2030”. This Mission was initiated by the United Nations. A big thank you to FAST PHO’s team and customers for joining this extremely important mission on 16 March 2018. 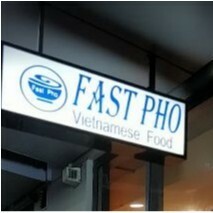 FAST PHO is small restaurant which is located in ULTIMO near the BROADWAY Centro, between UTS and Sydney Uni, perfect for quick lunch and casual dinner. FAST PHO proudly serves the best traditional South Vietnamese cuisine.